This is the prefect recipe for special occasions where you are going to have guests, to which you want to impress and you don’t have much time. For those moments this dip can make the big difference. The advantages that this dip offers is that is very easy to prepare and the ingredients are very easy to get or it may be possible that you already have them at home. Regarding to the preparation in a blink of an eye it will be ready and it doesn’t require of any experience in the kitchen. Now regarding the dip... your guests are going to taste a dip with a creamy consistency and a flavor that is soft, sweet, a bit spicy and with that touch of sea coming form the tuna. It really doesn’t matter which snack or appetizer is placed in front of this dip, it will give an exquisite flavor that will fascinate your guests. This is a good recipe for beginners as very simple tasks are preformed. The tuna that is used in this recipe has to be canned and it can be bought in water or in oil. To give a spicy touch to this dip pickled jalapeno pepper is put. This chili can be bought canned or you can prepare it with us. In this recipe also cream cheese is used and it has to be natural and without any flavoring. The dip will be ready in 10 minutes . Discard the veins and the seeds of 1 pickled jalapeno pepper. 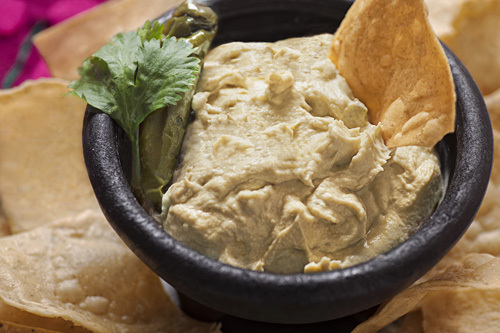 The veins and the seeds of the jalapeno pepper won’t give a good texture to the dip that’s why they are removed. Finely chop the pickled jalapeno pepper with the one you worked and reserve it. Remove from 1 can of tuna the water or the oil and put the tuna in a blender. The Pulp of 1 Avocado. Pour in a bowl the avocado and tuna dip, add the pickled jalapeno pepper that was cut and mix very well the ingredients with a mixing spatula. Tip: To prevent the surface from turning black, cover the bowl with a piece of food wrap film ensuring that it directly touches the dip. In this way the air doesn’t interact with the dip and it won’t oxidize. Did you like the Avocado Dip? Prepare the dip with these avocados they are a guarantee of quality and of good flavor. These are the pickled jalapeno peppers that you can use to prepare the dip. The advantage of using La Costena is that it has the best seasoning. Impress your guests even more by serving the dip in this small molcajete.